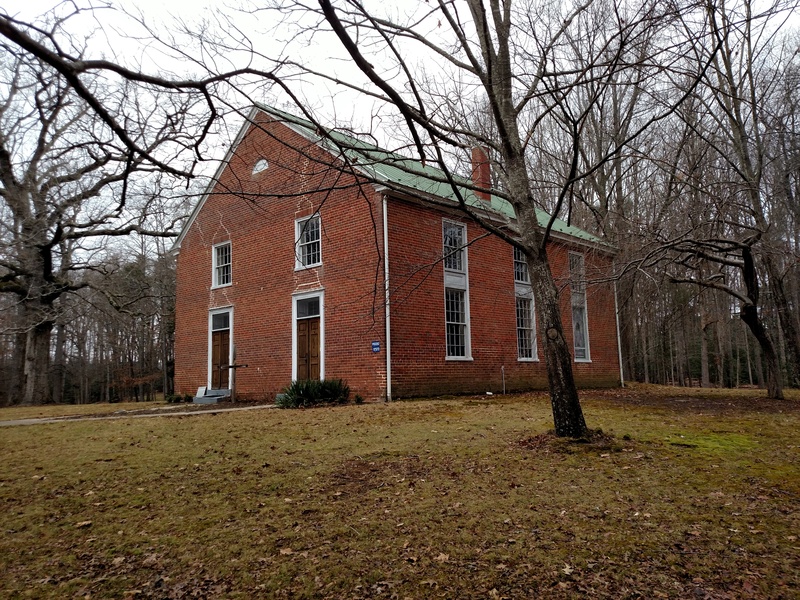 Liberty Chapel, built in 1850, was the worship place of a Baptist congregation which began in the late 1790s. “Liberty Baptist Church is associated with one of the oldest Baptist meetings in Caroline County, Virginia. The earliest reference to the church dates to 1796, with more formal organization following in the 1810s. The present church, a brick nave-plan building built in 1850, is a well-preserved example of the churches built in the county during the antebellum period. The interior features Greek Revival detail and a slave gallery. From the Second World War to the present, the building has served as the Post Chapel for Fort A.P. Hill, and it is the only pre-1941 religious building to survive on base. 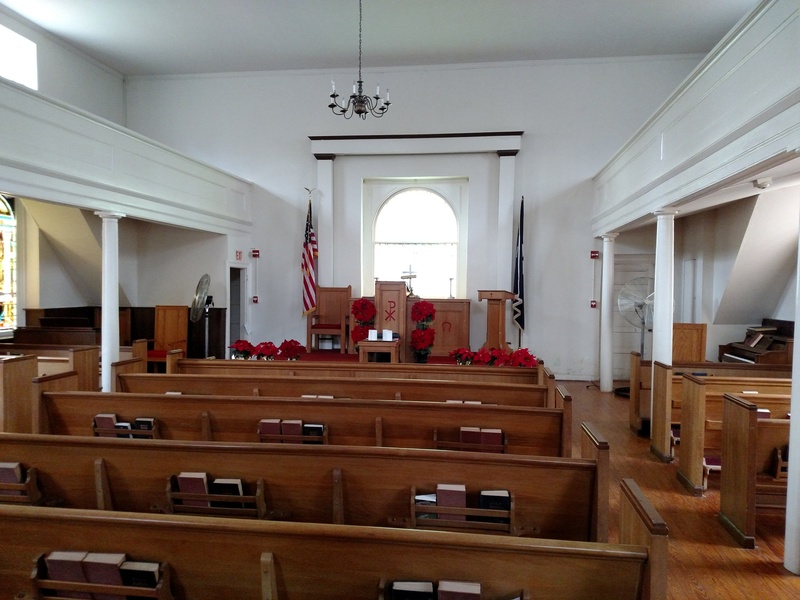 Interior of Liberty Chapel, built in 1850. “…Services were held at Liberty Church on a monthly basis until the 1930s, when a bimonthly schedule was instituted. In 1939-40, the Rev. J.R. Noffsinger undertook a renovation of the church and grounds, installing electric lights and placing markers over all known graves in the cemetery. “Less than a year after this work was completed, the congregation learned that the military would take its church and other properties in northeast Caroline County to create the A.P. Hill Military Reservation. The last service, an all-day program, was held on June 1, 1941. 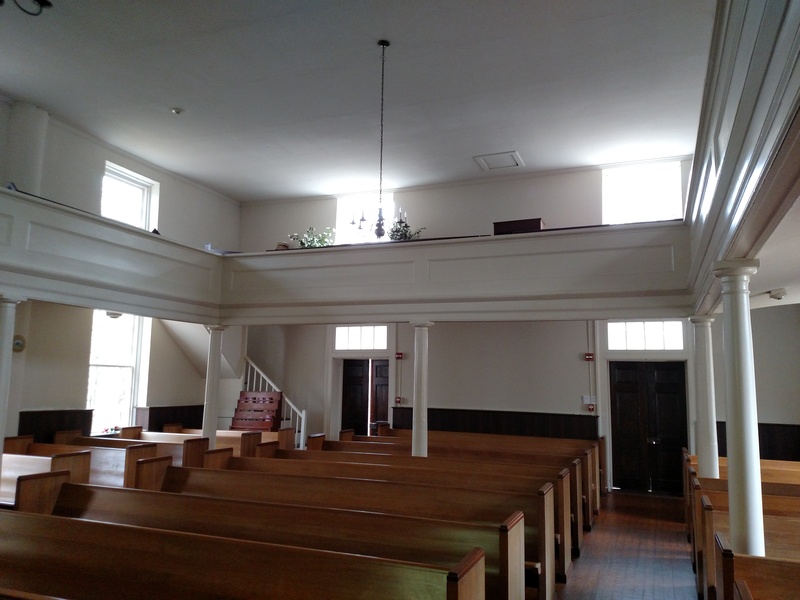 Balcony, or gallery originally intended for black members of the congregation. “…Most preexisting buildings acquired by the military were torn down or allowed to deteriorate, but Liberty Church was pressed into service as the Post Chapel in 1942. During World War II and after, the Post Chaplain held services in the church. In recent years services have been conducted during the summer only. Other groups have used the chapel for religious worship, including the Virginia Military Academy (which maintains offices at nearby Heth camp) and former members of Liberty Baptist Church, who held annual homecoming services through the 1960s.”2 Today, Liberty Chapel is only used for special services, such as the Fort A.P. Hill Christmas Candlelight Service.